A thick, apocalyptic air hangs over Ejecta, looming in a familiar extraterrestrial shape, and the film does all it can to outrun the shadow of a crowded genre. With Tony Burgess guiding its script, it has a better chance than most; in recent years, the Canadian author has positioned himself as one of the genre’s more distinguished voices—which is kind of why it’s a bummer that Ejecta feels a little familiar despite a tricky narrative structure that only takes it so far. Hints of Burgess’s prose peek though during an opening narration that muses lyrically on the end-times, which possibly loom in the distance as a rare solar event may hearald close encounters of the apocalyptic kind. Doomsayer William Cassidy (Julian Richings) has anticipated their arrival for the past forty years after surviving an abduction and has spent the majority of his life as a reclusive, notorious figure in conspiracy-minded corners of the internet (so, the internet). When blogger Joe Sullivan (Adam Seybold) receives a cryptic message from Cassidy, he sets out to document a meeting that goes horribly, mysteriously awry. Ejecta then spends about 70 minutes patching together these events by jumping between two time frames. One—and for this writer, the superior—half is dedicated to William and Joe’s encounter with an alien craft that lands in the former’s backyard. It’s relayed via found footage, of course, meaning it presents an abundance of well-worn techniques: a mockumentary structure, the faint sheen of faux-verite authenticity, and shaky camerawork that captures just enough spookiness to string the audience along. Even if this particular brand of alien invasion film has become suddenly congested in recent years, it’s one I’ll never shun out of principle, and Ejecta operates well enough in this mode, particularly when it features an obscured creature terrorizing William and Joe in the woods. The other half, however, is much less dynamic despite being less conventional. Set a short time after William and Joe’s experience, it capture the former’s interrogation at the hands of a shady government cadre headed by Dr. Tobin (Lisa Houle), an icy agent determined to pry information by any means necessary. A stark contrast to the dynamic, suspenseful thread, this story is a sluggish, repetitive slog, full of in-your-face gore (thanks to unusual, brain-ripping interrogation methods) and overcooked performances. Houle’s turn is especially high-strung in a role that positions her as a heartless ice queen without much explanation, her status as a government agent seemingly meant to be enough to explain how she has few qualms about drilling holes in someone’s head. Whenever the film switches to this storyline, it grinds to a near-halt. Sandwiched between both William and Joe’s experience and an eventual military search, this portion of the film can’t quite keep up—after a certain point, you get the sense that everyone’s just sort of waiting for it to tie together with the rest of the film. Even though these segments are slick, flashy, and accompanied by a relentless score, you can’t shake that it’s a dry collection of dramatic close-ups without much actual energy driving them. As Ejecta wears on, this portion of the film begins to feel like dead weight being dragged along by the more intriguing bits surrounding it. Taken as a whole, Ejecta is an appropriately schizophrenic experience, one that mixes typical found footage jolts with Call of Duty-inspired run-and-gun sequences, but—in true exploitation fashion—also has to lean on stagnant, talkative scenes. Its disjointed structure mirrors the fractured psyche of William, the film’s unifying element and a conduit for its unsettling, cerebral horrors. Ejecta preys on the fear of the unknown on a cosmic scale but grounds it in Richings's bifurcated performance; he’s cagey with both Joe and Dr. Tobin, but he’s subtly sinister when dealing with the latter, his nervous energy having transformed into something more anxious and urgent. At best, he seems like a man hoarding a secret; at worst, he’s a man possessed, and Richings masterfully paints a portrait of a broken, haunted man who is both terrified and excited about the past 40 years of his life suddenly being validated. Once its various threads intertwine with a twisty, brain-popping climax, Ejecta finally begins to feel like the work of Burgess, however faintly and briefly. Between Pontypool and Septic Man, has almost become the Canadian analogue to Stephen King in that his work twists familiar genre tropes into something fairly different or offbeat. 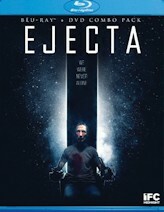 Ejecta may be the least of these efforts, but it at least infuses an extraterrestrial apocalypse with sense of terrible awe. With such a limited budget, it obviously doesn’t indulge in spectacle but rather taps into a Lovecraftian sense of ancient doom looking to reclaim a world that has always been theirs. We’ve just been keeping the seat warm, and the film’s insistence in our insignificance is more terrifying than anything it does show. Sometimes, the best recourse for a writer’s imagination is to let the audience run wild with their own. Ejecta arrives on DVD and Blu-ray on August 18th courtesy of Scream Factory and IFC's combo pack, which features the film's trailer as a special feature.